This year's holiday specials will be in a different format. My IHG (Izak's Holy Grail) system continues to provide 3000 units profit per year. I also have added extra features to it, to make it more profitable. The system is so good, that I would like to share it with you as a free strategy, also explain the additional features that alleviates the escalation of bets and the ways to make it gain more units per run. If you like the strategies, you are welcome to make a contribution to my PayPal account at: izak.matatya@videotron.ca, any amount your heart tells you or any amount you think it may be worth. The contributors will receive the entire documented IHG system and all its simulations at no extra charge. Moreover, as a holiday special, if you purchase two or more systems of mine, you can have a 50% discount per system. This offer is valid until January 7, midnight, ET. You can place your orders by clicking here. Now to IHG. In a nutshell, the bet selection is based on KISS, that is, you follow a streak or a chop based on the last 2 decisions. If the last two decisions alternate you bet on the opposite of last. If the last decisions repeat, you bet on the same as last decision. The only pattern which will make this fail, is the so called 2-chop. For this, you look at the last 4 decisions at all times. If the last decisions form a 2-2, that is, a pattern of the form PP BB PP, etc. you follow this pattern until it breaks once. The moment it breaks, you're back to following the streak and the chop based on the last 2 decisions again. The bet method is based on a double win strategy. After each loss, you bet only 1 unit. You keep track of the amount you are down at all times during the run. After a win, you look at your net amount for that run and you bet 1 unit more than that amount. Thus a second consecutive win will close the run with 1 unit profit. If your bet after the win is a loss, you register the loss into your net run and resume betting 1 unit until your next win, after which you bet again 1 unit more than what you're down. Every double win closes a run. L L W L W L L L L L L W W, etc. The concept is that there will be two consecutive wins somewhere down the road, which will make you close runs without a steep progression after each loss. The nemesis in this system, as you may have already noticed, are the single wins. The more single wins we get before a double win occurs, the higher bets start going. The original IHG system has a special money management once we reach 6 or 7 single wins. The special feature that I will now reveal is quite different. We could have up to 10-11 single wins before the double win occurs, which will bring your bets to high amounts. We could have a stop loss or stop betting after 6 single wins. This makes us abandon a run with a certain accepted amount of loss. Instead of that, we will start a run with a certain amount that we will "borrow" from our net run. By borrowing, we mean that we will start a new run with some extra units, such as 6 units. And when we close a run, we will return those 6 units back to our bankroll and still fish for 1 unit profit at the end of the run, which will close on a double win. By doing so, we will not raise our bets drastically after a single win happens. Because we will raise our bets only when the net for run is negative. When we borrow those 6 units, we will be positive at the beginning of the run, thus there will be no need to raise our bets after single wins. This strategy alleviates the raising of our bets for a few initially occurring single wins. In other words, we will be "saving" some single wins until eventually the double win occurs and we will be betting much less by the time we close our run. The best way of showing this will be with a concrete example. As you can see, we bet 1 extra unit more than our negative balance (Net for Run) after each single win. But if a double win does not occur, bets escalate up to 124 units until we close the run at Shoe 13 Hand 14 because we had 5 single wins before a double win. Because of the new strategy, the new run starts at Shoe 12 Hand 61. We have extra 6 units we borrowed from our bankroll. So our first loss at Hand 62 brings our net for run to 5 units. The double win at Hands 63 and 64 do not close any run, because we are positive in it anyway. We continue betting 1 unit. The single win at Hand 69 does not raise our bets next, because our net for run is still +3. We will only raise our bets after a single win, if the net for run becomes negative. The net for run is negative within this run only at Hand 13 of Shoe 13 and goes to -1. Now that it's negative, after this win we will raise our bets to close the run. We won't be betting 2 units though, because we need to return the 6 units we borrowed back to our bankroll. So we bet 2 units plus the 6 units we borrowed, thus 8 units. The net for run becomes 7 units. Relative to the Overall Net of 92 units of Shoe 12 Hand 60, we are ahead by 1 unit for this run. We see now that with this technique, five single wins did not affect our bets, as borrowing a certain initial amount left us positive in the run, until it became negative only much later. Runs do close a bit slower with this strategy, but we avoid the escalating of the bets, which is a more major issue. Closing a run with 8 units max bet is much better than closing the same run with 124 units. Another technique to make our overall net more profitable is simply to bet a few more units (such as 4) when we are ready to close a run. At Hand 7, we would require the betting 2 units to close the run at the double win. Instead, we bet 2+4 = 6 units, thus our run closes with the net of 5 units instead of 1. At Hand 37, we would bet 21 units instead of 17, etc. You can set for instance the Initial sum for run to 6, as in Example 2 and 0 out the extra units for closure. The end profit is lower, but bets are much less escalated. 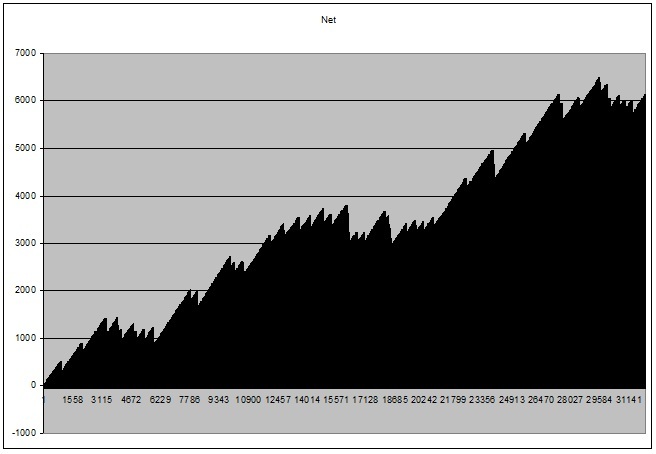 You can even reduce the max bet limit to 25 and still get profitable results combining all strategies for even bets. Those are great strategies to increase your profits and reduce the amount of bets escalated under certain circumstances such as single wins. Again, as mentioned, your contributions will be much appreciated, if you like those strategies, to my PayPal or Skrill accounts: izak.matatya@videotron.ca. And you can have the original IHG system sent to you into which you can apply the special additional techniques of this newsletter. And don't forget to take advantage of the 50% discount offer until January 7, if you purchase 2 or more of my systems. Wishing you Happy Holidays with your families and friends and a Happy and Prosperous New Year 2015.